Pit Stop USA is The Online Motorsports Superstore! We feature Power Steering Cylinders at low everyday prices. 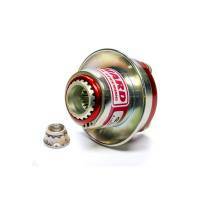 Check out the Recently Listed Rack and Pinion Bushings and Mounts. Collapsible steering columns are engineered to reduce injury and to eliminate flexing and bending of the steering shaft work well in all types of race cars. The column may be mounted using a column clamp and dash brackets. Check out the Recently Listed Steering Shaft Joints/U-Joints. Remove steering wheel quickly for easy entry and exit. Pit Stop USA is The Online Motorsports Superstore! We feature Steering Wheel Disconnects at low everyday prices. Replacement and Service Parts for Woodward Rack and Pinion Assembly. Woodward pioneered the use of caged needle rollers with a slight preload to create a joint without backlash and with noticeably lower reversing inertia than conventional automotive designs. Pit Stop USA is The Online Motorsports Superstore! Woodward Machine Corporation is a leading manufacturer of power steering systems, safety steering columns, steering universal joints, and other precision components for auto racing. In 1979, Tony Woodward designed a rack and pinion steering for use in North American dirt track stock cars (such as they were at the time, which meant up to 4000 pounds and included features like rebar welded around the wheel rims and rub rails on the sides). Over the years, this form of racing, while still retaining much of its original resemblance to armed combat, has evolved to a point where levels of technology greatly exceeding those permitted elsewhere are routinely employed. The continuous development of the Woodward Power Rack and Pinion has taken place first and foremost in this extremely demanding arena, which has resulted in a highly versatile and mechanically sophisticated product capable of withstanding heavy abuse. Refined and improved over twenty years, it has come into widespread use in road racing as well as on oval tracks. Many variations are now available, including right hand drive. Other, more recently introduced products now in widespread use are the Woodward needle bearing universal joints and safety steering columns, which are installed in almost the entire NASCAR Cup field. Woodward Manual Type G Racks basic rack and pinion design is suitable for virtually any manual steering application. Woodward Power Rack and Pinion Most add power-assisted operation by bolting on a G150 direct-mount cylinder with the appropriate rod bracket. A complete system also requires servo, pump, reservoir, and hoses. We feature Woodward Precision Power Steering, Woodward Steering Universal Joints, and Woodward Collapsible Steering Shafts at low everyday prices.